We are often asked by new members, prospective new members and even by other genealogy societies about events and subject matter that we provide at our regular monthly meetings. Below is a list of activities for 2016. Today was a very busy day for the VGS. The morning began with the Brick Wall SIG meeting followed by our General Monthly Meeting. Our guest speaker was Michael Lacopo. He presented "More Than The Census: Our Families Did Exist Within Those Ten-Year Intervals" to nearly 250 attendees. During the meeting, the election for a new president was conducted with Pat Adams being elected for the 2017-2018 term. In the afternoon, Mr. Lacopo conducted a workshop for 100 attendees for the German SIG where he presented "How to Overcome Brick Walls in German Records." While that meeting was in progress, the New to Genealogy SIG was meeting where 35 members learned about "Using the Internet for Research." Mr. Lacopo's handouts are in our "Members Only" section for a linited time. "Little Known & Under Used Features of The VGS Website." From comments after the meeting and from emails to the presenter, the meeting was well received. One member wrote:"Thank you for the informative program yesterday. I was in awe of the amazing things available to me through VGS. I have a lot of work to do with your material, but am beginning today to add to the surname research and explore the resources available to me. Wow, thank you so much. What a capable and outstanding group of folks you are!!!!" We had a fantastic turnout for our Family History Expo on September 28th. Well over 1000 residents attended! My Heritage and Family Tree Maker Software participated and both were busy the entire day. My Heritage provided some very nice door prizes and Family Tree Maker offered a $40 discount on their software. Several door prizes were also provided by Ancestry.com, AncestryDNA, FTDNA, Fold3, Newspapers.com, National Genealogical Society, New England Historic Genealogical Society and VGS Membership Chair Pat Otterberg. Our Membership grew to 1135 with nearly 100 being added today. Next month we begin another full season of events and guest speakers. In September we will have a Family History Expo. Please see the article below for further information. We had a smaller turnout for our June Summer Series Workshop with about 90 members in attendance. We featured a webinar "Taming Your Inner Packrat" presented by Lisa Alzo. She stressed the importance of a system that works for you that also can be understood by someone else who may be trying to access your material. This is most important after the passing of the owner. Organizing is not just for genealogy; it's for all your personal belongings. 2 handout are available in the "Members Only" section of our website for this webinar. May is usually the lowest attended meetings of the year since so many of our members have gone north and returned home for the summer. However, the 135 in attendance today were presented with an interesting methodology on how guest speaker Hank de Cillia went about researching his family tree. He had 13 suggestions for "Finding Your Roots" with number one being: See yourself as gathering information to "tell your family story". It's much more rewarding than simply "collecting data". Become a family history detective. His handout will be available for a limited time in the "Members Only" section of our website. 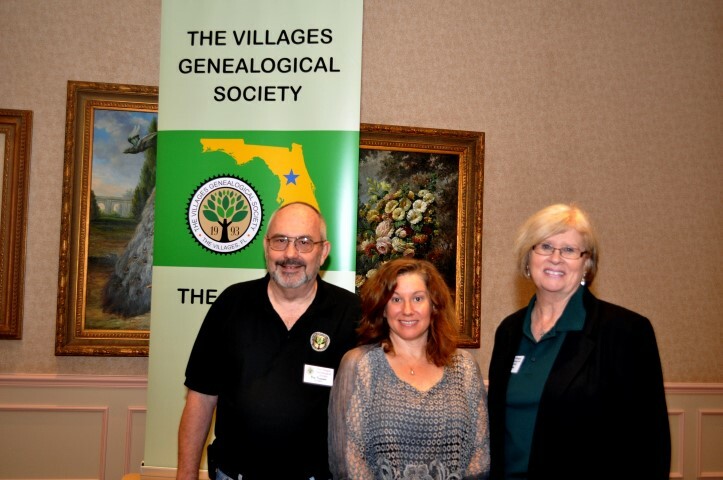 The New England Historic Genealogical Society, the oldest and largest non-profit genealogical society in the country came to The Villages on Friday, April 1, 2016. A full house greeted the NEHGS staff and their presenters. The Villages Genealogical Society was well represented with over 30 members in attendance. A cocktail reception was held after the conference. See more images in our Photo Gallery. Our April 27, 2016 general monthly meeting was attended by 215 members. Our guest speaker was George Morgan. His presentation was, "Dissect Obituaries for New Clues", was well received by our audience with many questions being asked following the presentation. A tremendous potential source of genealogical information. Due to a meeting location change beyond our control, we apologize to those who could not attend the meeting due to space limitations. A copy of the handout is available in the "Members Only" section of our website. A copy of her handout is now available for a limited time in the "Members Only" section of our website. Our first general meeting of 2016 was held January 27th at the Savannah Center with over 400 members in attendance. This was the largest attended meeting in the history of The VGS. Our guest speaker, Debra Fleming, presented "Using FamilySarch.org. According to Ms. Fleming, Family Search is the most underutilized wed site in the genealogical community. Why is that? While the above is true, FamilySearch.org is a very useful web site for research and education. A copy of her handout is in the "Members Only" section of our website.